Sometimes called the more cosmopolitan ibis, the Glossy Ibis, is the most widespread ibis species. It can be found in South, North and Central America, southern Europe, Africa, Asia and Australia. In the US it primarily lives along the Atlantic coast but can also be found in a variety of inland wetlands. A nomadic wading bird, Glossy Ibis often roost communally at night in large mixed flocks, sometimes a good distance from their feeding wetlands. Description: The Glossy Ibis’s head, neck, back and underparts are a rich chestnut-brown. The wings are black with a metallic green sheen, there is a white stripe from the base of the bill to above the eye and the bill, legs and feet are greenish-brown. In fall, a dark iris is a key identification marker. Voice: Usually silent but will emit a nasal croak or quacking sound. White-faced Ibis – Reddish legs and lore bordered with white, RED iris, white line around lore and eye. Herons – have straight not curved bills. Habitat: Wide variety of habitats, shallow lakes, swamps and marshes, ponds, rivers. Floodplains, wet meadows and irrigated agricultural fields. 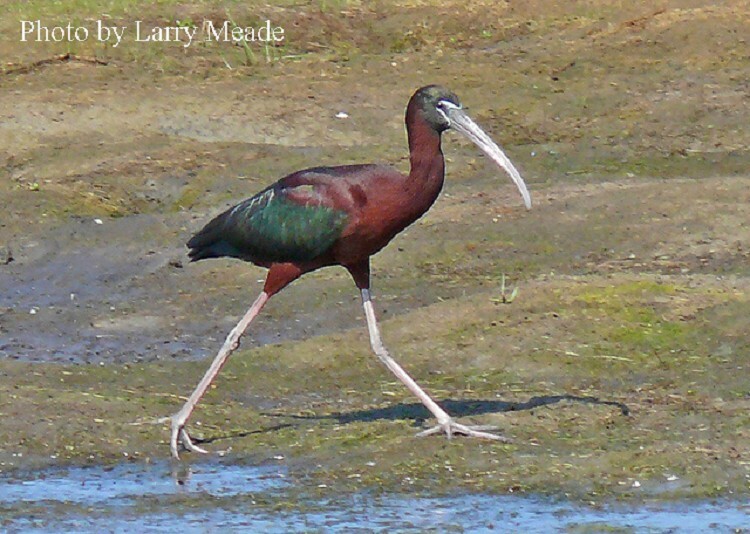 Status in Tennessee: The Glossy Ibis is an very uncommon migrant in Tennessee. Predators of the Glossy Ibis are Birds of Prey and alligators. Glossy Ibis is capable of short swims but seldom does.